Want to catch the thrilling conclusion to the US PGA Championship golf today absolutely free? Of course you do – we'll tell you how to live stream it, no matter where on Earth you are. It's all set up for a riveting final Sunday of golf, with US Open winner Brooks Koepka leading the field. He's got Adam Scott, Rickie Fowler and Jon Rahm just a few shots behind. 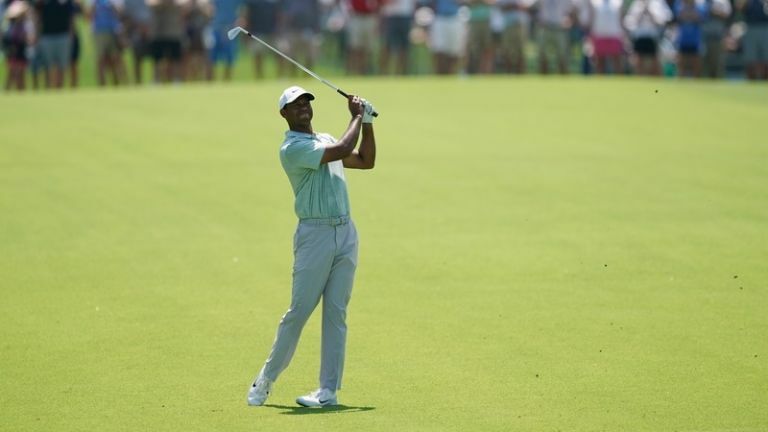 But surely the most compelling narrative for the PGA Championship conclusion is the prowling Tiger Woods, who is only four shots off the lead and has his best chance for a major in a decade. The 2018 US PGA Championship has seen some really low scores shot around the beautiful Bellerive Country Club in St. Louis Missouri. So it feels like anything could happen today - it just takes one player to get on a birdie run and the trophy could be theirs. Getting a live stream from a golf tournament's official website seems to have become the new normal in 2018. And the US PGA is no different. So it's simple... head to PGA.com and you'll be presented with a media player from which you can choose from watching featured groups, or simply the 16th, 17th and 18th hole when the players make it round to the final stages. Be warned though - this is no slick telecast, but is ideal for catching what should hopefully be a thrilling finale. If you head to the site and discover that you're geoblocked from watching, then you'll need to download and install a VPN as described above instead. Who? The newly launched Eleven Sports is starting to rapidly build its live sports portfolio, and the US PGA Championship is its first big coup. And the really great news is that you can get a one week FREE TRIAL, meaning that you can effectively watch the last day of the tournament for literally nothing. After that it will be £5.99 per month or £49.99 for a whole year. Alas, there have been some early teething problems for Eleven and some fans have been vocal about the poor coverage. So if you don't want to go through signing up for that free Eleven Sports feed, then you can jump over to PGA.com as described above. Not in the UK but want to catch either of the above choices? Then you'll need a VPN to log into a UK (or US for the latter) IP address. If you don't want to risk the potentially dodgy Eleven Sports and want something more comprehensive than what PGA.com is offering, then you could try the CBS coverage in the US as it has a week's FREE TRIAL for its All Access streaming service. Be warned though, you'd need a US credit card to do this, so won't be possible for most people. If you want to watch on your TV, you can catch all the action from the final round on CBS or TNT. Both services are carrying the last 18 holes - particularly great, as it looks likely that a home-country hero is likely to take the championship. Let's go, Tiger! If you're not in the US but want to watch the televised US coverage via their websites, you're going to need a VPN to do so. Simply sign up for Express VPN, dial in to a US location (it's really easy) and then go to your chosen service. But if you're a cord cutter or don't want to subscribe to a service, then there's always that PGA.com coverage as described above. It may not have the broadcast sheen of the other two, but at least it's free and easy to get.